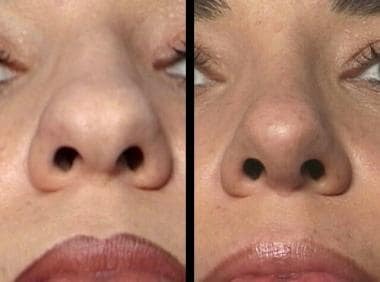 Refinement of broad nasal tip has been a challenge since the first rhinoplasty was performed. Successful narrowing of the nasal tip requires a thorough understanding of the causes of broad nasal tip and the different tools available to address each cause. Skill in a variety of approaches and procedures is required to properly address the diverse anatomy encountered in treating broad nasal tip. Although prevalence has not been studied, broad nasal tip is a common reason of patients seeking rhinoplasty. Broad nasal tip is the dominant problem in many rhinoplasties, while in others it may be a secondary concern. Multiple anatomic causes for broad nasal tip exist. The bulbous nasal tip appears as a broad rounding of the area of the lateral crura of the lower lateral cartilages. Commonly, the broad nasal tip has strong and broad lower lateral cartilages. A bulbous nasal tip appearance results when lower lateral cartilages have strong bidomal configurations. Excessive divergence of length of the middle crura can also contribute to a wide, boxy tip appearance. From the basal view, a trapezoidal or rectangular configuration to the tip may occur due to an increased angle of divergence of the middle crura. A weak cartilaginous structure and thickened nasal tip skin create a broad nasal tip with poor definition in some patients. This is common in patients of Asian or African descent and can be very difficult to correct. At times, a combination of thick skin and strong cartilage may contribute to broad nasal tip. The triad of thin skin, strong cartilage, and lower lateral cartilage bifidity is important (see image below). Special care must be taken to avoid overexcision of lateral crura in patients with a bulbous tip with this anatomic triad; dome-binding sutures should be applied during rhinoplasty. Great care should be taken to achieve a smooth cartilage result. Otherwise, patients with this triad are at special risk for bossa formation. Preoperative and 6 months postoperative patient with thin skin, strong cartilages, and tip bifidity is pictured. Double-dome sutures, conservative cephalic resection, and tip grafting can be performed to narrow the nasal tip. Each anatomic configuration has different solutions. "Cookie cutter" rhinoplasties do not exist. Instead, the experienced surgeon chooses from a variety of techniques, depending on the patient's individual anatomic characteristics. Kilavuz AE, Bayram AA, Serin GM. The Benefit of a Complete Cephalic Trim and the Importance of the Scroll Area. J Craniofac Surg. 2016 May. 27 (3):779-80. [Medline]. Goldman IB. The importance of the medial crura in nasal tip reconstruction. Arch Otolaryngol. 1957. 65:143. Simons RL. Management of the lower third of the nose: Vertical dome division. Rhinoplasty: A Practical Guide to Functional and Aesthetic Surgery of the Nose. Kugler Publications; 1998. 314-9. Simons RL. Vertical dome division in rhinoplasty. Otolaryngol Clin North Am. 1987 Nov. 20(4):785-96. [Medline]. Skouras A, Asimakopoulou FA, Skouras G, Divritsioti M, Dimitriadi K. Use of the Goldman Technique to Correct Both the Overprojected and the Broad Nasal Tip. Aesthetic Plast Surg. 2011 Jun 30. [Medline]. Skouras A, Asimakopoulou FA, Skouras G, Divritsioti M, Dimitriadi K. Use of the Goldman technique to correct both the overprojected and the broad nasal tip. Aesthetic Plast Surg. 2012 Feb. 36(1):54-61. [Medline]. Adamson PA. Nasal tip surgery in open rhinoplasty. Facial Plast Surg Clin North Am. 1993. 1:39-52. Constantian MB. The two essential elements for planning tip surgery in primary and secondary rhinoplasty: observations based on review of 100 consecutive patients. Plast Reconstr Surg. 2004 Nov. 114(6):1571-81; discussion 1582-5. [Medline]. Daniel RK. Rhinoplasty: creating an aesthetic tip. A preliminary report. Plast Reconstr Surg. 1987 Dec. 80(6):775-83. [Medline]. Gruber RP, Friedman GD. Suture algorithm for the broad or bulbous nasal tip. Plast Reconstr Surg. 2002 Dec. 110(7):1752-64; discussion 1765-8. [Medline]. Johnson CM, Toriumi DM, eds. Open Structure Rhinoplasty. Philadelphia, Pa: WB Saunders Co; 1990. Kridel RW, Soliemanzadeh P. Tip grafts in revision rhinoplasty. Facial Plast Surg Clin North Am. 2006 Nov. 14(4):331-41. [Medline]. Leach JL, Athre RS. Four suture tip rhinoplasty: a powerful tool for controlling tip dynamics. Otolaryngol Head Neck Surg. 2006 Aug. 135(2):227-31. [Medline]. Lee KC, Kwon YS, Park JM, et al. Nasal tip plasty using various techniques in rhinoplasty. Aesthetic Plast Surg. 2004 Nov-Dec. 28(6):445-55. [Medline]. Lo S, Rowe-Jones J. Suture techniques in nasal tip sculpture: current concepts. J Laryngol Otol. 2007 Aug. 121(8):e10. [Medline]. Romo T 3rd, Kwak ES, Sclafani AP. Revision rhinoplasty using porous high-density polyethylene implants to reestablish ethnic identity. Aesthetic Plast Surg. 2006 Nov-Dec. 30(6):679-84; discussion 685. [Medline]. Cartilage shape and strength should be palpated and anticipated preoperatively. Conservative cephalic trim of lower lateral cartilages alone can be effective in addressing a mildly bulbous tip. When performing domal suturing in a patient with strong lower lateral cartilages, conservative cephalic resection slightly weakens the cartilage, allowing it to bend. At least 8-10 mm of cartilage is preserved to retain strength. Mattress sutures are placed to move the domes slightly cephalad, providing slight upward rotation of the tip. Great care is used to place these sutures in a symmetrical fashion. Sutures are carefully tightened to create the new dome. One suture can be left long on each knot so that they can be tied together. Alternatively, an individual interdomal suture may be placed. Sutures are joined to create a double-dome suture. Care is taken to make sure the domes are at equal levels. If the suture is not perfect, it is removed and replaced. Dome division to narrow the nasal tip: Division and suturing also may have secondary tip effects in tip projection and rotation. A tip graft may be used in certain situations. Tip grafts can be used to create the illusion of a narrowed tip. Placement in different areas can have different effects. Postoperative result is superimposed over tip modifications.